IMF Chief Resigns Ahead OF Bail Hearing; Syria Condemns U.S. Sanctions : The Two-Way Dominique Strauss-Kahn quits as chief of IMF; there's talk about selecting his replacement; Syria condemns the U.S. for sanctioning its president, Bashar al-Assad; Japan goes into recession after quake disaster; a virus is killing horses in the western U.S. and Canada. 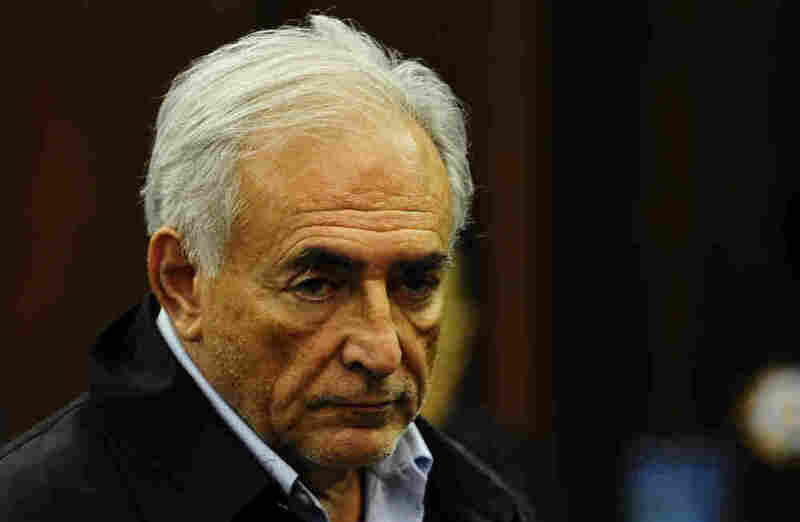 Former IMF chief Dominique Strauss-Kahn in Manhattan Criminal Court in New York City on May 16, 2011. Dominique Strauss-Kahn is quitting as managing director of the International Monetary Fund. He'll briefly leave his jail cell today to again ask a judge to free him on $1 million dollars bail while he fights charges he sexually assaulted a hotel maid. NPR's Joel Rose tells NPR's Newscasts a grand jury heard testimony yesterday from the woman about the alleged assault. The Wall Street Journal reports DSK's sudden resignation touched off a world-wide race to find his successor. Europe wants to pick the new chief but emerging economic powers believe their candidates should be considered, such as South Africa, Thailand and South Korea. The AP says Syria has condemned the U.S. decision to impose sanctions on Syrian President Bashar al-Assad. Syrian state television says the action won't affect Syria's decisions and are policies that serve Israeli interests. Japan says its economy is in recession, following the Tohoku earthquake and tsunami in March. The country's GDP contracted 3.7 percent in the first quarter of the year, and revised data shows it was down in the previous quarter. Financial Times says the yen is falling on the news. A virus is killing horses in the western U.S. and Canada. At least 17 horses have perished from the Equine Herpes Virus-1, according to AP, and the outbreak has been traced to a Utah horse competition held in early May. The Salt Lake City Tribune says about 500 horses were there and all future equine events in Utah have been postponed.